Not to be confused with Ray Knight (rodeo organizer). Knight was a .232 hitter with two home runs and 19 runs batted in when he assumed the role of starting third baseman for the "Big Red Machine" following Rose's defection to the Philadelphia Phillies in 1979. Knight responded with a .318 Batting average, 10 home runs, 79 RBIs and 64 runs scored to finish fifth in National League Most Valuable Player balloting. On May 13, 1980, Knight broke out of an 0-for-15 slump by homering twice in the fifth inning of a 15-4 win over the Mets. He was the first Red to ever hit two home runs in one inning. Aaron Boone matched the feat August 9, 2002. He made his first All-star appearance in 1980, hitting a single off Tommy John in his first at-bat. Knight managed the Reds from 1996 to 1997, and served as acting manager for a single game in 2003. In 1997, he forgot how many outs there had been in a half-inning in which the Reds were at bat and called for a bunt at an inopportune time. He later fined himself $250 for the incident. The team's lack of success would lead to his firing midway through the 1997 season in favor of Jack McKeon. Knight was one of several members of the 1986 championship team not to attend the 20th anniversary celebration at Shea Stadium on August 19, 2006; the others included manager Davey Johnson, (who was managing Team USA in Cuba), Dwight Gooden (who was serving a jail sentence), Roger McDowell (who is the Atlanta Braves pitching coach), Lee Mazzilli (who was the New York Yankees bench coach), and pitching coach Mel Stottlemyre (whose reasons for not attending are unknown). While the official reason given for Knight's absence was a previous commitment, many have speculated that it was more likely because of his treatment by the organization immediately following his heroics in the 1986 World Series. 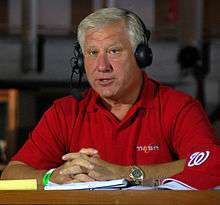 Ray Knight was previously married to Nancy Lopez, a now retired LPGA golfer. They had three daughters together: Ashley Knight who is the oldest, Erinn Knight who is the middle, and Torri Knight who is the youngest. He also briefly caddied for her. They lived in Albany, Georgia and also had a home at The Villages, Florida. He also has a son from a previous marriage, Brooks Knight. Knight is a member of the Golden Gloves boxing association. ↑ "Cincinnati Reds 5, San Diego Padres 2". 1974-09-10. ↑ "Cincinnati Reds 15, New York Mets 4". 1980-05-13. ↑ "Two Home Runs in One Inning". ↑ "1980 All Star Game". 1980-07-08. ↑ "Best of the bunch. Mets no strangers to fisticuffs on the diamond". Retrieved 2008-02-27. ↑ "New York Mets 6, Cincinnati Reds 3". 1986-07-22. ↑ "1986 World Series, Game Six". 1986-10-25. ↑ "Ray Knight". Baseball Reference. Sports Reference LLC. Retrieved August 2, 2016. ↑ "86 Mets reunite at Shea". 2006-08-19.